Is the Sony Cybershot DSC-HX20V the travel zoom camera of the year? There's no doubt the fixed lens compact camera market has been hard hit by the quality and convenience of the smartphone and its use for everyday snapping. The photo industry's response is an increasing volume of long lens, 'travel zoom' cameras. These marvels of miniaturisation squeeze zooms upwards of 20x into pocket-friendly proportions, thus outstripping the humble phone's reach. 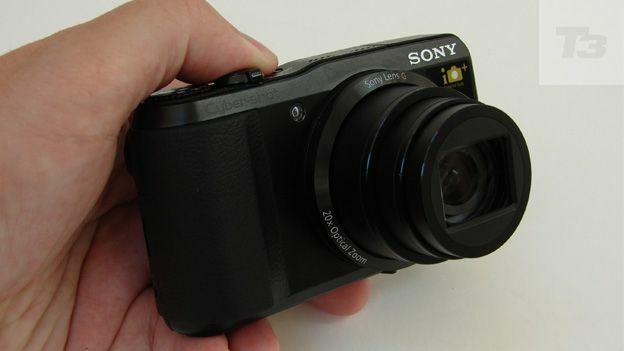 Though not the cheapest example, the 20x optical zoom Sony Cyber-shot HX20V is one of the more sophisticated travel zooms available, also offering GPS, panoramic shooting and Full HD clips. Indeed it won the top prize in our September issue's compact camera group test. Here the broad focal range is equivalent to an ultra wide angle 25-500mm on a 35mm film camera, so this camera is as adept at shooting landscapes as it is delivering paparazzi-like close ups. The headline resolution is the highest in its class at 18.2 megapixels from a 1/2.3-inch CMOS sensor, when the vast majority of competing pocket cameras make do with 16MP. More pixels crammed on the same sized chip can result in a 'noisier', gritty appearance when it comes to shadow detail and low light snaps. While we found those taken at higher light sensitivity settings of between ISO3200 and a maximum ISO12800 on the Sony had a slightly artificial appearance due to in-camera compensation, results were still usable. Competing travel zoom cameras include the identically priced and very closely specified Panasonic Lumix DMC-TZ30, Canon PowerShot SX260HS, Olympus SZ-31MR, Nikon Coolpix S9300 and Samsung WB850F, to name but a handful. So what else does the Sony Cyber-shot HX20V have to place it out in front and justify a high-ish £349 manufacturer's asking price? This black finished metal bodied compact boasts a better build than most and comes complete with a very useful rubber surfaced handgrip to one side of the face plate to support single-handed snapping. Effective anti shake is particularly important for shots taken towards maximum 500mm equivalent zoom, and lens-shift (optical) type image stabilisation acts as 'braces' to this 'belt'. Otherwise, hidden top right of the lens when not in use is a self-raising flash, the positioning of which helps avoid the red eye effect, plus fingers straying in front. For those who occasionally want to do more than just point and shoot, the HX20V's creatively comprehensive auto and manual shooting options presented on the larger than average top plate dial are only matched for number and versatility by those of Panasonic's TZ30 – probably its closest competitive match. At the back there is a red record video button, a playback button, menu and delete buttons, plus a control pad come scroll wheel for tentatively tabbing through, or alternatively racing through, presented menu options. In other words it's a commendably straightforward array. The Sony's back screen LCD is the regulation issue 3-inches, boasting a crystal clear 921,600 dot resolution, which is on a level with most mid range digital SLRs. The screen may present users with the standard 4:3 physical aspect ratio, but this default view narrows to a familiar 16:9 widescreen display once the video record button top right of the LCD has been pressed and filming commences. Battery life is a respectable 320 pictures from a full charge of the provided NP-BG1 lithium ion cell, which beats most rivals at an average 200 shots per charge, and even stretches ahead of Panasonic's TZ30 which provides 260 pictures. The actual replenishing of the Sony's power is carried out in-camera with the aid of a provided USB lead and mains plug rather than a standalone charger. On the downside this means that the camera is in use every time it needs recharging, so buying a spare battery is less advantageous. Given the lens reach on offer here, paparazzi-like candids are put within reach of the amateur. Fortunately then, the Sony's features and performance when it comes to image capture doesn't disappoint, and sharp shots can be achieved with impressive consistently even at full zoom without the aid of a tripod – which isn't always the case with travel zooms..
Apart from crisp and colour rich stills throughout the expansive focal range we also get 1920x1080 pixels video with stereo sound, captured at a 50fps frame rate for a more cinematic feel when replayed at half that speed. If a 25mm equivalent wide angle setting isn't enough to cram all that's required into the frame then take advantage of the 2D or 3D Sweep Panorama feature, which takes a successive burst of shots and automatically composits them together to form – for the most part - a seamless elongated image. It's worth noting that 3D files not viewable on the camera – you need a Fuji W3 for that – but rather via a suitably equipped TV. For those who are viewing this camera as a possible back up to a DSLR, worth playing with is a background defocus mode. This helped us to generate impact full portraits that appeared as if they'd been shot with a DSLR. And this all from a camera that can be fetched out of a back pocket. Our only quibbles with the Sony HX20V's imaging performance are just that. Chief among these is a noticeable softness and slight curvature towards corners of frame when shooting at maximum 25mm equivalent wide angle setting, with the usual bugbears of pixel fringing and burnt out highlights plaguing shots when conditions are bright. Though not a match for a DSLR or one of Sony's own NEX compacts, HX20V picture quality was such that we'd certainly consider leaving those alternatives at home for everyday snapshot occasions. If the above all sounds like the perfect travel zoom in principle, the 18.2 effective megapixel, 20x optical zoom HX20V with its expansive 25-500mm focal range and 3-inch back screen also comes very close in practice. Generally this metal build pocket camera comes across as a 'best of' the Cyber-shot range. In fact the only real negatives are the high-ish manufacturer's cost, though street prices are a good £50 cheaper. Plus we had the usual very, very minor niggles over its imaging performance that in fairness plague 99.9% of all compacts. Ultimately then, seek a fairer price and in the Sony Cyber-shot HX20V you've got one of the very best travel zooms around – indeed, in our opinion it's the current king.